In the past, your garage door had the potential to be the least secure part of your home. Thankfully there have been great strides in this area and now your garage door can be just as safe as any other door in your home. At Precision Door Service of Spokane, we make your home's security one of our primary priorities, beginning with our state of the art, technologically innovative garage door openers. Our garage door operators come fully loaded with features designed to not only keep your possessions secure, but also to keep you and your loved ones safe. From advanced technology to simple mechanical upgrades, here are some essential security components to keep in mind when you are comparing garage door openers. With all of the benefits that come with technological advances in modern living, there are an equal amount of security concerns. Older garage door openers have been wrought with issues involving hackers and code grabbers who find ways to intercept your remote�s opening codes and let themselves into your home. This makes investing in newer models, with current technology all the more essential. Today's openers are designed with security features including rolling codes and encryption which can generate billions of combinations making it nearly impossible to be illicitly cracked. Perhaps one of the most common methods used to break into home garages involves the use of the emergency release cord. This cord, when pulled, allows your garage door to be operated manually meaning that if it is accessible from outside, it can be a fairly serious weak link in your home's security. Thieves have been known to use a simple wire hanger or the like, inserted through a crack in the door, to pull this cord and open your garage door. Here's where complicated advancements aren't always all that necessary! Newer, quality garage door openers have come up with a simple tweak to completely fix this old design flaw by requiring the cord to be pulled back instead of down in order to release. Still just as easy to operate in an emergency situation, but much more logical for security purposes. Remote lockout is a nifty little feature on Precision Door operators that allows the homeowner to disengage all remotes while leaving the keypad operational by simply holding down the Lock button on your wall station for three seconds. After doing so, the LEDs on the panel will flash. This is a convenient feature to use when you leave town or have a remote lost or stolen. To reengage, simply hold the Lock button down for three seconds again until the LEDs are solid. 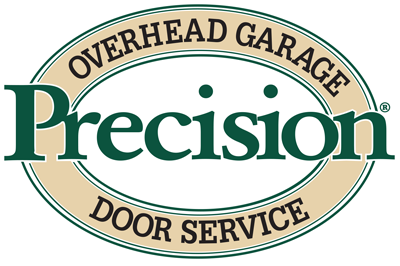 For questions on garage door security or any of your garage door needs, please give our professionals at Precision Door Services of Spokane a call today! I am more than happy with the service I received! Chris did a fabulous job. I'm so happy that I will be buying a new opener from you in the near future.